After a long night of drinking and partying, I wanted something easy on my stomach. The original plan was to go out for dollar oysters, brunch and bloody mary's but I just couldn't do it. 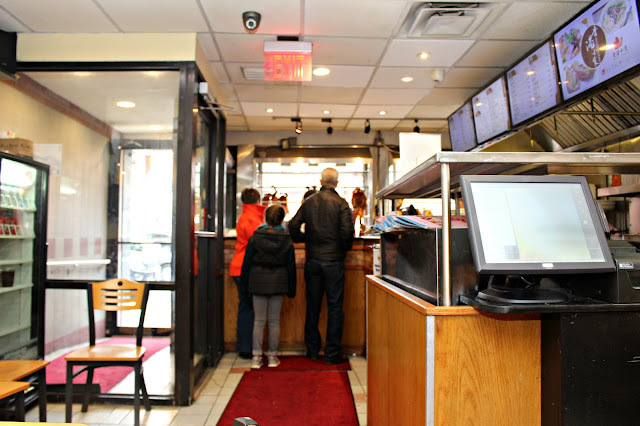 We drove from our hotel to Chinatown and paid $15.00 for parking at Chau Chow since street parking wasn't available. I didn't want Vietnamese Pho noodle soup since I could get that in Lowell (and I'd be going over to the in laws to eat that later) so I looked up "Chinatown Boston Noodle Souip" on Yelp and Hong Kong Eatery came up. 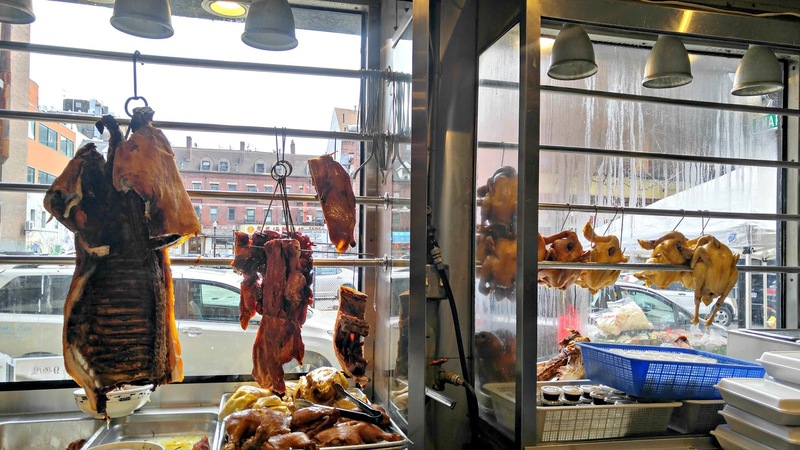 Boston's Chinatown isn't that large so the walk from the parking lot was a mere 2-3 blocks. 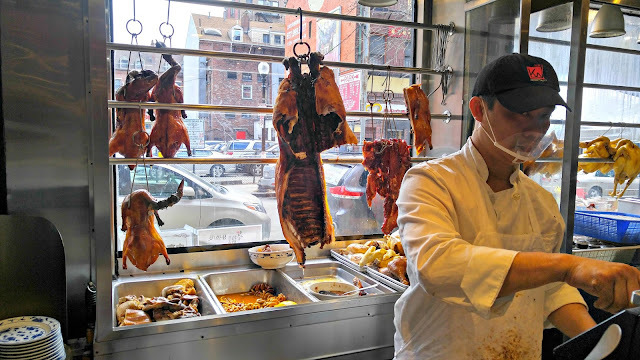 We approached the restaurant with windows displaying fresh roasted ducks, chicken and pork. We arrived around 10:30 AM during the down time and there were only a few other tables being occupied. I was relieved because some of the reviews said the place gets packed and there's usually a line out the door. 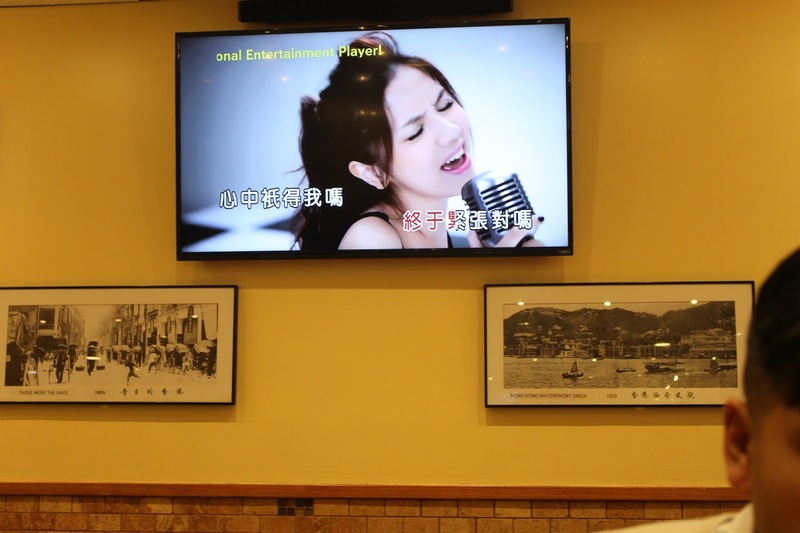 There is an entertainment system in the restaurant featuring karaoke videos and episodes of the Chinese version of "The Voice." 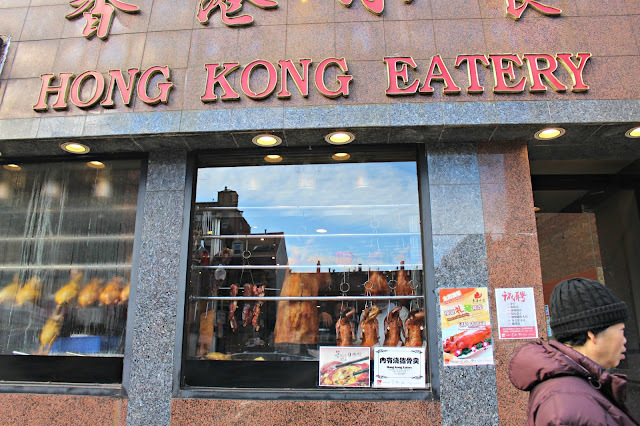 The noodle soups are prepared by the entrance where the roasted meats are cut and sold. When orders are placed, the staff quickly assembles the hot bowls using the noodles, broth, blanched Chinese vegetables and top it off with the requested roasted meats. 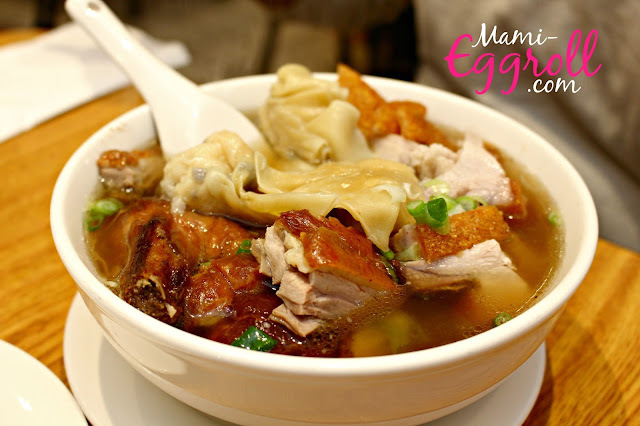 We each ordered a bowl of noodle soup with roasted duck, pork belly and Chinese dumplings. The soup was very large and hearty. The broth was on the bland side but the salty pork and duck gave it some flavor. I also added some hot chili oil and soy sauce to take it up a notch. I also got a side of wontons, which was a meal within itself. It was very good and there were generous amounts of shrimp. 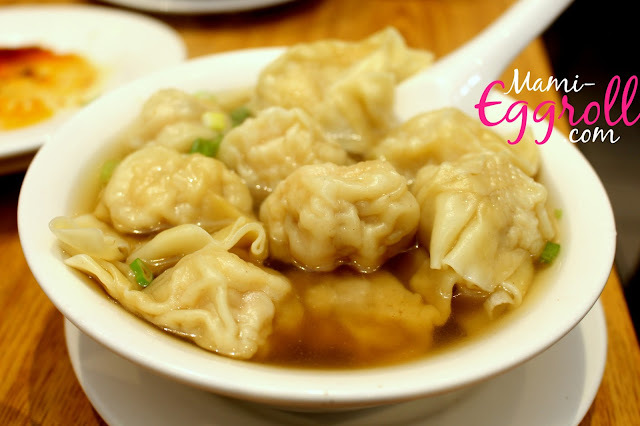 The wontons keep falling out of my chopsticks and I almost asked for a fork. 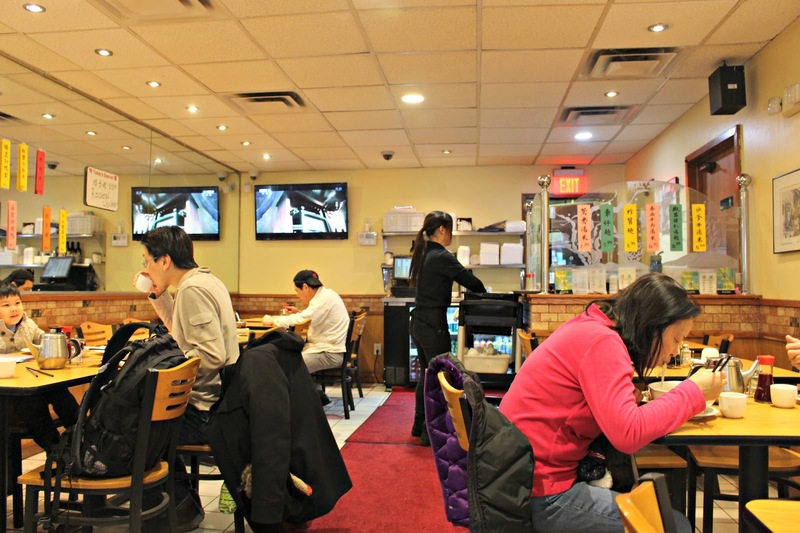 For the 2 noodle soups and the wonton, the bill was only $22.00. That's pretty good compared to the original plans that would have set us back at least $100.00. 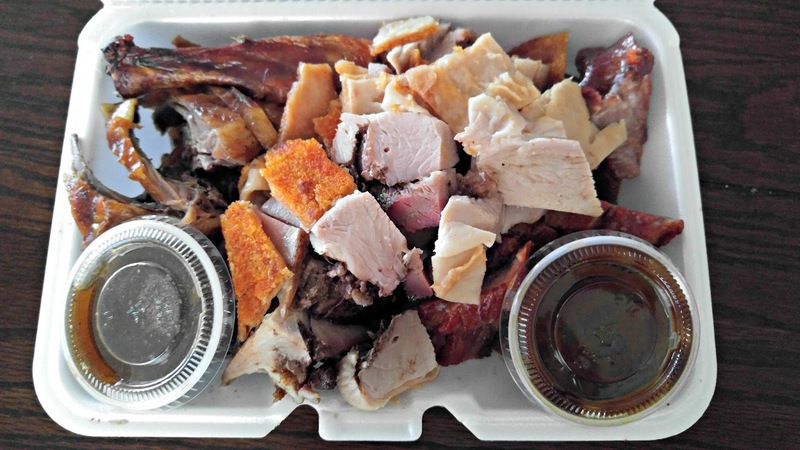 I was so impressed with the duck and pork belly that I ordered some to take home. It was quite busy and I waited for the line to die down. For $59.00, I ordered a whole duck ($20.00), 2 pounds of pork belly and a pound of BBQ pork. I had them separate the order and make 4 "combo" platters with a little bit of everything so that I would be able to share the goodness with my family in Lowell. Here's what each container looked like. 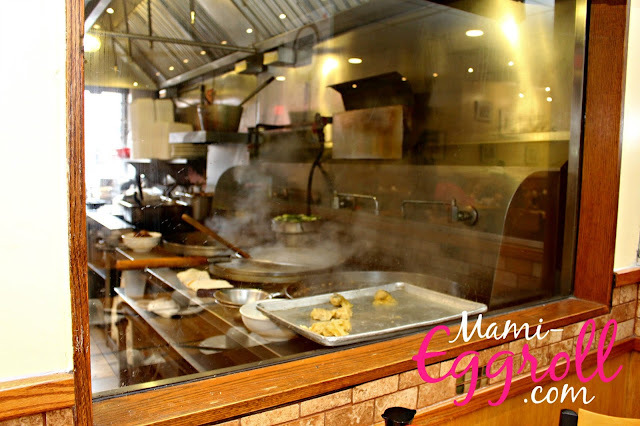 The servers were extremely friendly and the restaurant was SUPER clean (that's uncommon for Chinatown restaurants). If I'm in the area, I'd definitely order from them again.